fame, outline many a horizon with their high, fluffy-looking, outward reaching evergreen branches. Our native white pine (Pinus strobus) has been considered the monarch of the Canadian forest—and for good reason. This tree offers a cornucopia of healing and nutritional support. White pine is identified by its long, soft needles which form clusters in groups of five, while other types of pines form needle clusters of just two. White pine needles also have a white stripe running lengthwise from the base to the tip. The needles are richly nutritious with vitamins A, C and K. A tea made with a small handful of needles steeped in one to two cups of water for 10 to 15 minutes has a mild citrus-like flavour. A cup of this tasty brew can help to fight respiratory infections and boost immunity. The tea will be more potent if covered while it steeps. This helps to keep the aromatic volatile oils (which contain many healing constituents) from evaporating out. A little lemon juice and/or honey could enhance its effectiveness and make it even tastier. Pine needles and bark have strong anti-inflammatory and antibacterial properties, particularly in the respiratory tract. They can help to open the bronchial passages in cases of congestion and asthma. Their tea, being rich in flavonoids and antioxidants, can also serve as a healthful tonic that supports cardiovascular, as well as eye and skin health. The pine trees of this region thrive in cold, dark winters as well as the heat of summer, pulling up vitamins and minerals from deep in the earth, and assimilating energy through their evergreen leaves with the help of the northeastern sunlight. Their ability to adapt themselves to harsh conditions in a healthy way is indicative of the medicine they provide. White pine is considered by some herbalists to be an adaptogen- a class of herbs that safely and effectively support the body through periods of physical and mental stress, nourishing and balancing the endocrine, immune, nervous and cardiovascular systems. Adaptogens often support adrenal gland function. The adrenals secrete hormones that regulate the body and mind’s stress response. White pine helps to balance the stress response in an elegant and sophisticated manner such as that associated with adaptogens. It also tends to lift the spirits, and brighten one’s outlook on dark and dreary days. 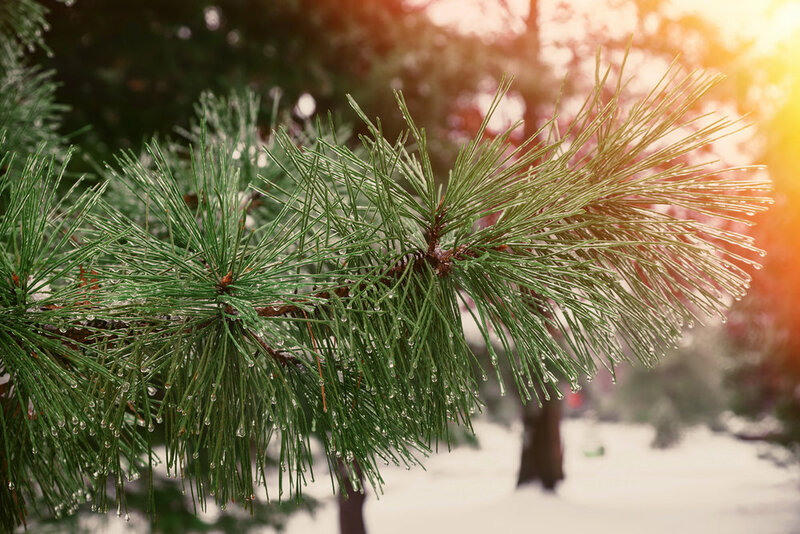 White pine can be harvested at any time of year—even in the deep dormancy of winter. A hike beneath the white pines in the crisp forest air on a sunny, snowy day is sure to lift the heart, facilitate deep breathing and shake off the winter blues. On such a walk, you may encounter a freshly fallen branch, with bundles of healthy green needles on it. With gratitude for the tree’s gift, this can be brought home. The bark can be shaved off with a knife, and the needles removed by hand. These can be steeped fresh into a healing tea, and/or dried and stored in a jar in the cupboard, perhaps for another winter day. The monarch of the Canadian forest grants us with abundant gifts. It is ours to learn to appreciate them.